Jackson, Ira R. D 20 dark 5' 9 1/2" blue brown tanner Ohio March 24, 1864 Louisville KY 3292037 Nat Cem, Sec B, row 8, grave 56, per ACWRD, died of disease. 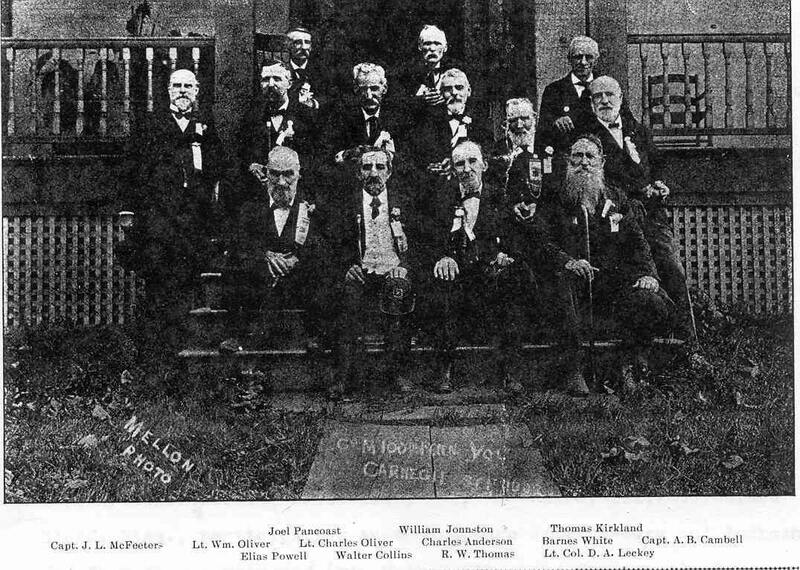 Jacobs, William M 18 2-Jan-1919 Nat Sold Home TN not found Per ACWRD, Feb 3, 1865 substitute--mustered out with regiment July 24, 1865. 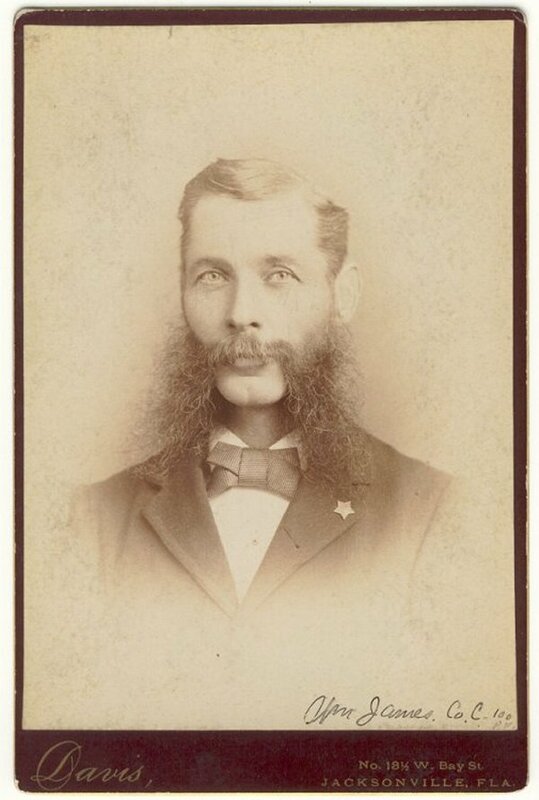 James, William C 22 clerk England Dec 28, 1839 11-Dec-1923 Jacksonville FL not found X went to Florida in 1866 for health because of chronic bronchitis after catching severe cold during the war. "Captain"; per ACWRD, birth date and location; also served in 33rd USCT and 10th IL. Jamison, Ewell C 19 clerk Illinois 1842 17-Apr-1919 New York NY not found Per ACWRD, detailed to drill colored troops on Hilton Head, SC and never returned to regiment. Jamison, Robert R. E 36 fair 6' 4" blue auburn Toeman Westmoreland Co., PA March 4, 1828 July 30, 1864 Petersburg VA not found wounded and captured at Petersburg VA July 30, 1864; killed per Oct. 15, 1884 reunion photo, son T.E. Jamison who settled in Aspen, CO.
Johnson, Charles A. F 29 tailor Eastbrook, Pa. Not Found No information found in ACWRD. Johnson, John A. G 20 26-Feb-1912 98119916 per ACWRD, on 2/20/1864 he mustered into "G" Co. PA 100th Infantry; He was discharged for disability on 2/27/1865; Other Information: died 2/26/1912; After the War he lived in Dickson, TN; findagrave.com info indicates middle initial "W"? Johnson, Robert J. D 27 spoolman Harrison Co., Franklin OH March 31, 1834 25-Feb-1902 Cadiz OH not found Deersville, hard of hearing; per ACWRD, wounded at Chantilly 9-1-1862 birthdate and death location. Johnston, John S. A 22 not found no other information available. 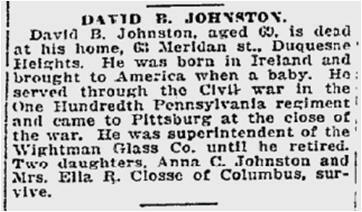 Johnston, Sylvester B 21 dark 5' 8" brown dark farmer New Wilmington, Pa. Phillipsburg PA Mercer Co., PA August 17, 1843 November 15, 1895 Beaver Co. PA not found Absent on furlough since 7-17-65. Jones, James H. K 38 not found March 8, 1865 substitute--mustered out with regiment July 24, 1865. Jordan, Jacob M 29 3-Mar-1914 Camden NJ not found Per ACWRD Feb 28, 1865 substitute--mustered out with regiment July 24, 1865. Joseph, John B 22 New Wilmington, Pa. not found discharged for Disability Sept. 2,1861 S.C. of D.. Buried in Fair Oaks Cemetery, Lawrence Co.; no other information found. Junkin, Joseph B. E 35 light 5' 10 1/2" blue light farmer Hope Mills, Mercer Co., PA Sept 6, 1823 May 13, 1864 Spottsylvania CH VA 33688413 Pension Index Card died of wounds rec May 12, 1864; see write up on findagrave page. Record shows that he is buried in Spottsylvania Confederate cemetery. However, several researchers have not found his grave there and some souirces indicate he died in 1923. This is a mystery that needs solving!